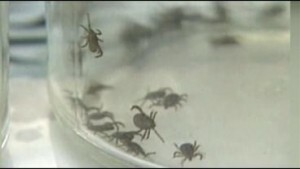 ALBANY, N.Y. – Ticks are now carrying a new, potentially deadly virus in our area. According to researchers at the Wadsworth Center, the deer tick virus, also known as Powassan virus, has been found in Saratoga, Albany, Rensselaer and Columbia Counties. Researchers who worked on a five-year study say that the amount of ticks with this deadly virus are increasing, and if someone have been bitten by a deer tick, there is a one in 20 chance that it has the fatal illness. Dr. Laura Kramer at the Wadsworth Center says symptoms people face after contracting Powassan virus include drowsiness, lethargy, headache and fever. In a recent case, Dr. Laura Kramer says the person with the virus died within 8 months of severe symptoms. Kramer says the virus ultimately leads to death in about 10 to 30 percent of the cases. Another alarming result of Kramer’s study is the virus is transmitted at a rapid rate, compared to the two days it takes for Lyme Disease. “With Powassan virus, deer tick virus, it looks like it’s about 15 minutes,” she says. “We’ve seen an increase in ticks in both wooded areas so it’s been an initiative of ours to be more cautious,” says Kristen Usher, YMCA camp director. As campers head to walk trails, preventing tick bites is a major concern. The camp has asked for parents to help them, by taking a few simple steps. The best way to prevent contracting this potentially fatal virus, is to prevent ticks from attaching to you – wear long pants in wooded areas and use insect repellant.